The Natural Textile Company, founded in Vancouver in 1995, is a fabric retail store which specialises in home furnishing fabrics woven from natural fibres such as cotton, linen, silk, hemp. The fabrics come in all weights and weaves, from translucent combed cotton sheer fabrics to heavy jacquard woven brocades. Most fabrics are multi-purpose, which is to say that they can be used for draperies, upholstery, bedding and apparel -- in all cases, you will see the recommended usage for each fabric. Why natural fabrics? Well in the words of company founder Pippa Morgan - "whilst environmental concerns are an important issue for us, our decision to sell fabrics made only from natural fibres quite simply comes from the fact that we prefer non-synthetic textiles. Fabrics woven from natural fibres enhance home furnishing in a way that synthetic or synthetic blended fabrics cannot." Four things are important to us when it comes fabric selection - quality, design appeal, colour and texture -- we hope that these criteria will be obvious to you as you browse our site. Fabric buying is an interactive process, with lots of questions and answers. We encourage you to contact us with any questions or comments that you may have, please call us on our toll free number 1 866 333-4633(Monday -- Saturday 10am -- 5pm) or e-mail us at info@naturaltextiles.com. In a world of uncertainties, we know two things for certain. Firstly, regardless of how hard we have tried, the colour of the actual fabric is going to be different to the virtual sample which you will see on our site. So if colour is of importance, and sometimes customers are looking for very subtle shades, then please contact us for samples. Buying fabric, without having seen a sample, is a risky endeavor. The second certainty is that whilst you can browse around our site, it is impossible to touch the stock -- an unfortunate reality of virtual reality. 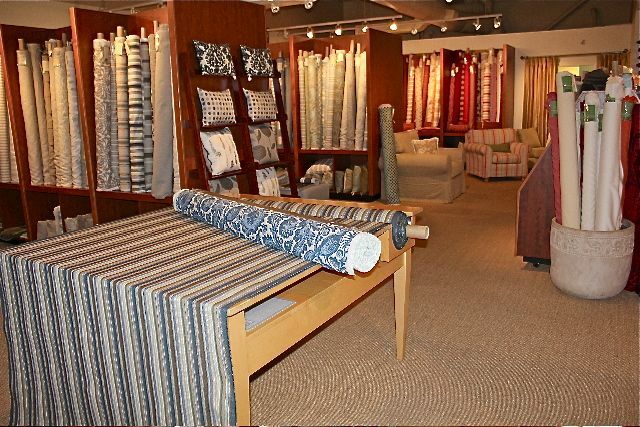 Colour and texture are two of the most important selection criteria to customers when they are buying fabric. We do not want customers to be misled by the "virtuality" of on line browsing, there is no substitute for being able to touch fabric samples, and see the actual colour. We strongly recommend that you request small samples or sample yardage before placing orders. If you would like to see samples, please e-mail or call us with the reference numbers of your sample choices, and we will post or courier 2" x 4" samples to you. We guarantee that all of our fabrics are first quality goods. Customers should understand that fabrics woven from natural fibres can and do have irregularities, particularly handwoven or handloom fabrics. Fabrics that have been laundered at the mill, or fabrics with a special surface finish, may also exhibit some weave or colour irregularities. These kinds of irregularities (as mentioned above) are normal and should not be regarded as flaws. We do not guarantee our fabrics in terms of wear, colour fastness, colour fading, or shrinkage. We do not make any warranty, express or implied, with respect to fitness for a particular purpose or merchantability of its fabrics. We have categorised each fabric in terms of its use suitability -- these are suggested use categories, and should be consistent with standards that customers might reasonably expect from non-synthetic home furnishing fabrics. All orders must be pre-paid in Canadian $ prior to dispatch using either MasterCard, Visa, or certified cheque. For custom order items, a 50% deposit is required at the time of placing the order, with the balance due at the time of shipment. Printed invoices with Visa/MasterCard receipts will be sent out with each shipment as proof of purchase. Ordering fabrics or products over the internet usually requires some degree of good faith and/or trust. In return for our customers� trust, we undertake to behave equitably and honourably when responding to customers� concerns. Customers in Canada may return fabric pieces of 5m or more for a full refund providing the fabric piece has not been cut or damaged in any way. Customers will be required to pay the return shipping costs. Customers outside of Canada may return fabric pieces of 5m or more for a full refund providing the fabric piece has not been cut or damaged in any way. Non-Canadian customers will be required to pay the return shipping costs and customs and brokerage charges. There will be no returns accepted or refunds given for fabric pieces shorter than 5m. Once again, to avoid disappointment, we recommend that customers pre-order samples before placing fabric orders. We cannot accept returns or offer refunds for custom items such as "made to order" cushions, shades, draperies etc. However, if a customer is unhappy as a consequence of a mistake that we have made, we will arrange for the collection of the item, its repair and return to the customer. If alterations need to be made, which are not our responsibility, we are pleased to do the alterations but will have to charge for the alteration work and all shipping charges. A lot of our business is generated from custom making draperies, cushion covers, roman shades etc. The "Workroom Estimates" form enables customers to complete simple questionnaires with regard to specific custom orders which are then e-mailed to us -- with the information provided, we are able to provide customers with accurate prices for custom making throw cushion covers, draperies, shades, foam cushions etc. These forms do not automatically calculate prices -- they just give us enough information to quote prices. Sometimes we will e-mail additional questions to the customer before submitting a quotation. Once again, please be reassured that quotes are submitted without obligation. Assuming that the fabric is in stock, custom orders usually take two to three weeks from time of the order confirmation. Unless otherwise specified, fabric or products will be shipped by UPS pre-paid. Prior to shipping, we will confirm the freight cost which will be added to the customer's invoice. For shipments to the US or overseas, freight will continue to be pre-paid. However, customs brokerage fees and import duties or excise taxes will be paid collect by the customer. In most cases, UPS are able to provide the customs brokerage services. If customers' prefer, fabric can also be shipped by Canada Post. In addition to the freight and brokerage charges, a packing charge of 5% will be added to each shipment.